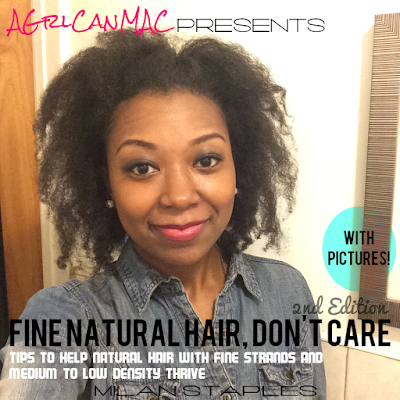 Yay, my book for fine natural hair is finally available! I had talked about it over the past few months and how I was almost done and I'm finally done! 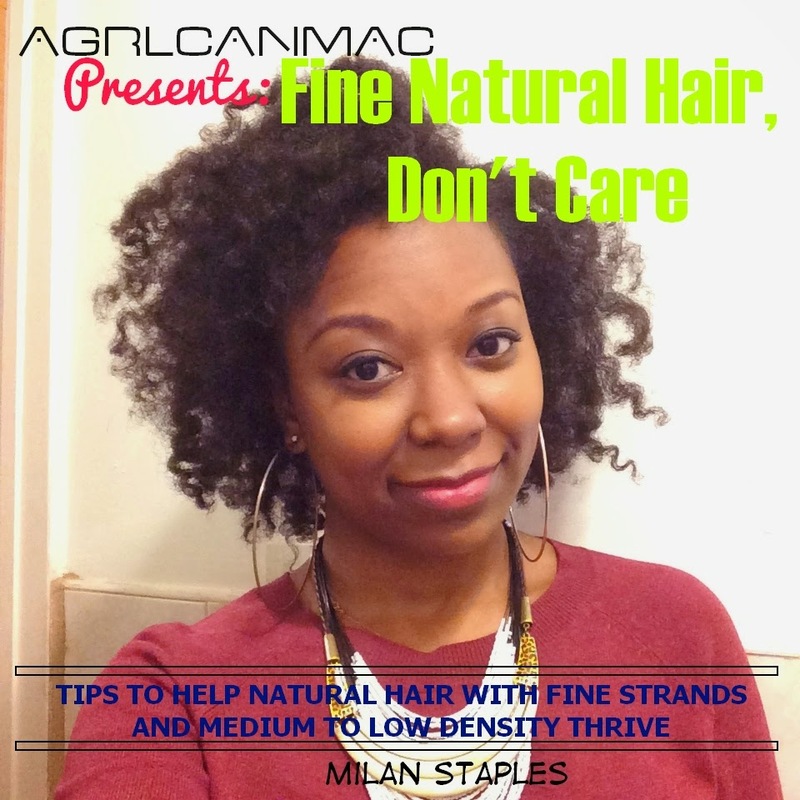 It is titled AGrlCanMAC Presents: Fine Natural Hair, Don't Care: Tips to help natural hair with fine strands and medium to low density thrive . As the title spells out, the e-Book is dedicated to those of us with fine natural hair of medium to low density. I couldn't find many resources out there for us all in one place. I would find bits and pieces scattered about in tiny morsels here and there so I decided to share tips all in one place to help others. I would have loved a resource like this earlier in my journey when I was still feeling things out. This is my first published piece of work. It's a quick and easy read, about 23 Amazon Kindle pages, and I hope that it will be a helpful guide in alleviating some frustration and confusion. It's available on Amazon for now, but in the future, I may research making it available through other resources and making it available in print! If you don't have an Amazon Kindle, you can totally still read the book! You will need to download the Kindle reader app, it's free, and then purchase the book through the Amazon website. This is important because the app doesn't allow you to purchase books on it, it's only a way to read Kindle e-Books.You have to download the app and then buy the book from Amazon website. This is a dream come true for me and only the beginning. I have more e-Books coming. Thank you so much for all your support, kind words, comments and readership. I appreciate it all and though this is my blog, I write and create to share with you all and help lift others up. I want to see us all thriving and living well and AGrlCanMAC will stand for no less than that. Please check out the book and share with family, friends and anyone you may know with fine natural hair of medium to low density. Thank you!!!! Milan is a New York City based, creative writer and the founder of AGrlCanMAC. She's a self proclaimed accessories junkie who's passionate about healthy living, adventure, books, crystals, the Law of Attraction and arts & crafts. AGrlCanMAC is a resource for women of color all over the world who want to look good, radiate good and feel good at the same damn time. Congrats Milan! Will be downloading on my iPad tonight! Heeey Erica! Thank you so much for your support! I appreciate it so much and hope that you will enjoy it!